Kang's current series Power Games contains subject matter that relates to the dualistic nature of life's cycle: destruction and renewal. She makes a powerful statement about survival within the inherently dangerous ecological environment in which life occurs. She demonstrates the Darwinist euphemism "survival of the fittest" in her works that contain flora and fauna as metaphors of life. The eagle or the phoenix stands as emblems of authority, at times attacking serpents or smaller prey. In turn, the serpent then attacks and devours a tiny bird or insect. This never-ending cycle of death is also one of renewal, for in nurturing the stronger, undoubtedly, life is also perpetuated. This is the natural rhythm of life that imposes order on chaotic nature. Kang's backgrounds are immaculately painted formulating smooth glossy surfaces upon which her natural motifs exist. 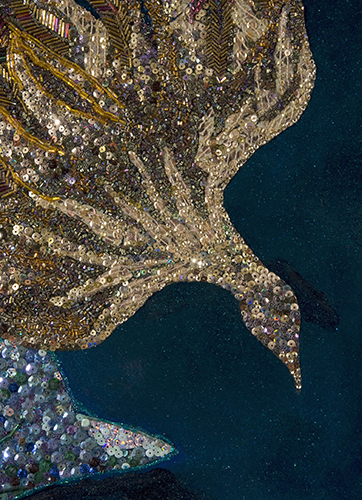 Her animals and plants are composed of beads, crystals and sequins painstakingly applied to her surfaces. They glitter and shine wearing crowns of glory like their royal human corollaries. At other times they swoop down in feathery exaltation to grab their quarry for the kill. Whatever form these entities take in the work of Kang they are glorious creatures that while sparkling in their pageantry cause us to think. Kang received her first MFA in Seoul and earned her second MFA from Pratt Institute in Brooklyn. The artist works and maintains a studio in Manhattan.